How do you feel about the home you live in? Do you love coming home after a busy day? Do you wake up in the morning and appreciate your space? I am pretty sure I could live more simply than I do and appreciate that, but for now I am incredibly blessed to live in a house I love. I find my home can affect my mood depending on how it presents at any given time. If I leave dishes on the bench, paint pots and dirty brushes out over night I can wake up irritated with myself in the morning. If my pot plants are healthy and thriving (which hasn’t always been the case!) it instantly makes me feel happy. I find the simple intention of making my home my sanctuary helps keep me on track for creating and keeping an environment I love. You’d be surprised at how the smallest of efforts can help uplift your mood and make you look forward to coming home even more. The key is to know yourself and what you love. Here are some ideas for you that resonate with me, so I hope they help you as well. According to a recent study, going out more and staying inside less is good for you. I didn’t really need a study to believe that but I guess for some people it helps to have a reminder. Sure, we can go outside for a walk, go to the beach etc but how about bringing some nature elements into your home? 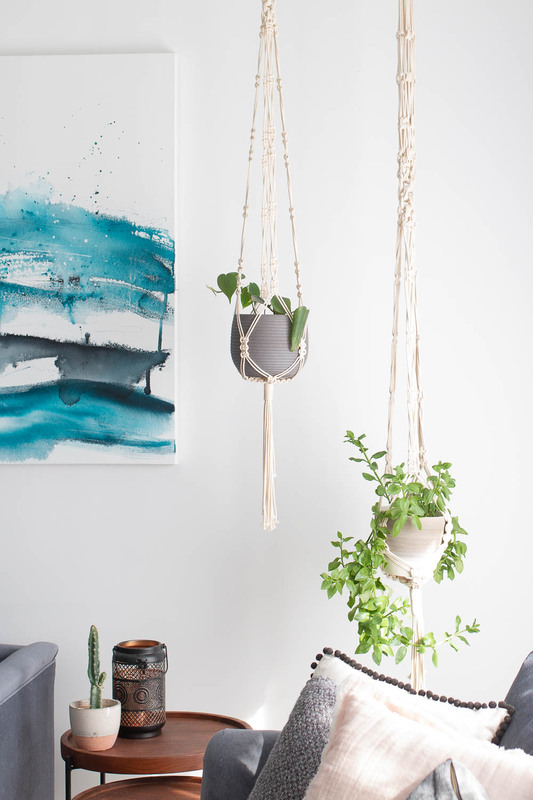 Scatter plants all over your house - I am obsessed with hanging plants at the moment. Plant your own herb garden in the kitchen. Paint areas of your house with earth-toned colors. Use furniture made out of natural elements like wood and stone. Use natural lighting as much as possible, candles and salt lamps are beautiful. I have a friend who only uses candles and salt lamps in the evenings. How beautiful is that. Speaking of being one with Mother Nature, when was the last time you went out for a walk and foraged? As in, literally, just walking into the woods or the park to pick up stuff? I often bring home sticks, paper bark and random things I find on the ground, and they live somewhere for a little while. Maintaining your connection with Mother Nature helps keep you grounded, motivated, and generally, happier, despite the hectic schedule of your day-to-day life. While we no longer have to forage these days to feed ourselves, simply picking up branches, barks, and leaves, can be a very uplifting experience, keeps you present and allows you to slow down. Your sense of smell is a lot more powerful than you give it credit for. Smell can affect our mood and can also connects you to your memories. Imagine waking up to a fresh pot of brewed coffee (yes please!) and freshly baked bread - would that even be real? But you can imagine it right? That sure would start the day off well wouldn’t it, even before you had your first sip of coffee or mouthful of bread with fresh butter. Okay, now I’m hungry. That may not be quite so realistic for us on an everyday basis, however there is a reason why many ancient cultures used aromatic plants for worship and healing; even then, they knew how powerful aromatherapy can be. Are you on the oil bandwagon yet? I love using candles naturally scented with essential oils - no fake fragrances here (unless my daughter is home, she loves that stuff!). Diffusing essential oils can have an amazing effect on your mood, and have even been show to help with depression, anxiety, and improving your overall productivity, oh and learning, so great for the kids before school! Aromatherapy can play a huge role in turning your home into the kind of sanctuary where you can sit back, relax and recharge yourself after a long day at work. My favourites to diffuse are wild orange, peppermint and geranium. There are plenty of beautiful oil blends around though, so try something that resonates with you. 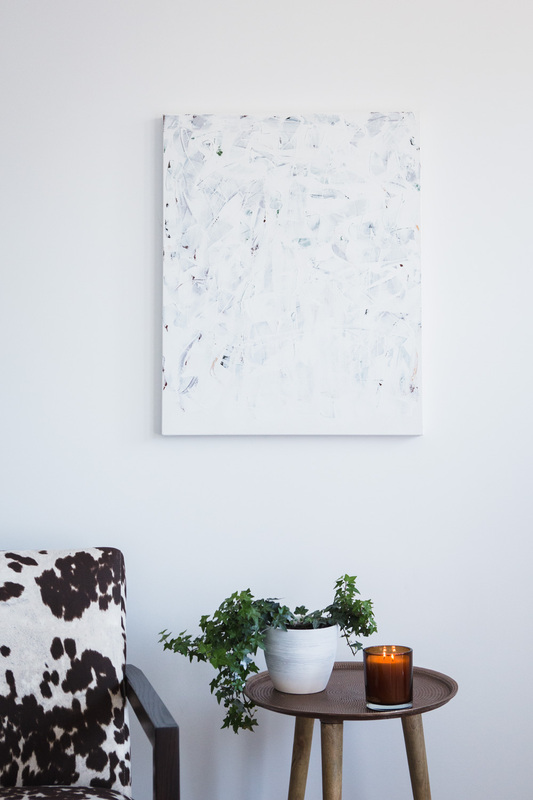 Choose artwork for the walls that inspires you. You are going to see it every day, so you sure as hell want to love it. I am pretty lucky in that I have decorated the walls of my home with my own artwork and photos. I have a series of images from a trip to New York in my dining room and then our hallway is decorated with some beautiful family images that I adore. The remaining space is for my paintings. My walls are pretty full but I am have some other artists artwork in mind when I find the right piece. The other element I love for the walls is macrame pot holders and wall hangings. I have fond memories of making macrame pot holders when I was a teenager so when I saw these making a comeback I was so excited. I love the natural element of the cotton and the fact that they are hand made. All my macrame has been sourced by makers I found on instagram. Declutter - let go of what no longer serves you. It is easy to get caught up in cherishing material things - I am certainly not immune to that. I like a nice, beautiful environment. I have however, lately come to the realisation that it doesn’t take that many things to add a positive vibrant energy in my environment. Actually for me, the less things the better. I love a clean uncluttered space. I love waking up in the morning to sun streaming in the windows, highlighting the leaves on my hanging plants. I just love the positive energy that gives me. You may like lots of little knick knacks and decorations, which can still be beautiful and make you feel great. I have seen lots of homes like this where the space is clearly cherished and loved. We are all different. The thing to keep in mind is to, “chose what sparks joy” which is from the book the “Life changing magic of tidying up” by Marie Kondo. This book was a game changer for me in how I keep my home but also how I appreciate my belongings. Remember, it doesn't matter how small or big your home is. With a few changes, a bit of letting go, and a different way of looking at things, you can turn your house into your very own sanctuary. You can find my original art here and my art prints here.